Another JET BUILDERS Masterpiece . 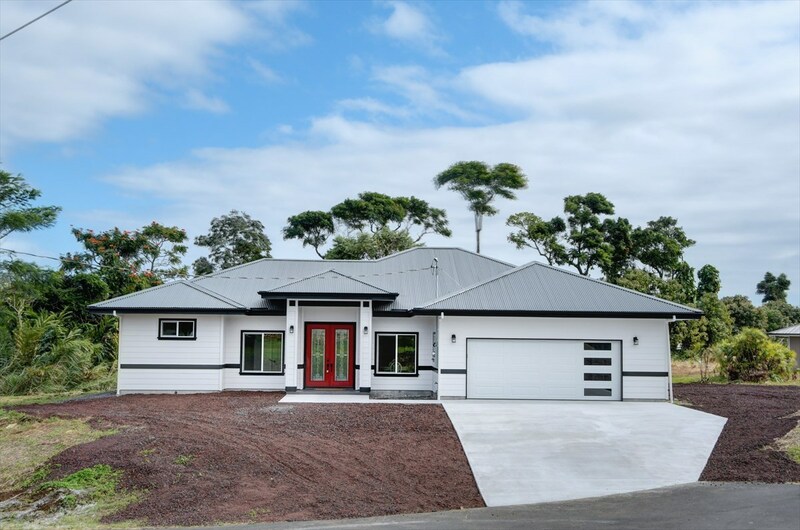 . . situated on lot for privacy at end of deadend road w/gorgeous views of MaunaKea & a peek-a-boo Golf Course view. Spectacular floor plan, insulation thru'out for comfortable indoor climate, always stunning w/beautiful finishes. Work of a master craftsman! Very high quality home w/grand entrance thru 8-ft high double entry doors! Colonial elegance w/unique craftsman style window & door wraps, as well as, crown molding on ceilings thru'out home, adding charm & character. Cambria Quartz (top of the line) counters in kitchen & all bathrooms. Flooring- Lifeproof vinyl, Clareview carpet in bedrooms, porcelain tile in bathrooms & kitchen. *** Special KITCHEN feature: Kitchen Aid Artisan Mixer in easy access special custom-made cabinet (pull up and out). Very nice chef's kitchen w/lge walk-in pantry, high-end Kraftsmaid cabinets w/self closing hinges, corner drawers, quartz granite double bowl kitchen sink, quality gas range. *** LIVING & DINING: 9-ft walls & vaulted ceiling w/nice lge ceiling fan, contemporary Triple Spiral Chandelier in dining area. Spacious & opens up to very private LANAI w/wide sliding glass doors & porcelain tiled floors. *** MASTER BED/BATH: Luxurious & spacious w/HIS and HERS closets... bathroom w/dual basins & special LED mirror lights w/finger touch control, walk-in tile shower w/Rain Shower head & heat sensor LED colored lights! Cast Iron soaking tub w/waterfall faucet. *** FAMILY BATH: Also w/LED mirror lights w/finger touch control. Additional features: Spacious laundry room located conveniently next to entry door from garage, lge storage closet in hallway. Versatile 4th bedroom located close to master bedrm- could be baby or young child's rm, playrm, den, office.